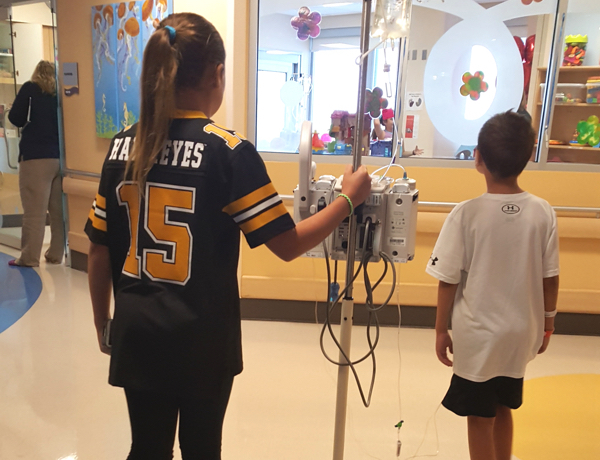 For the next several months, you could find me walking the halls of the hospital instead of the school — I spent most of my time in the playroom making friends with other patients or hanging out with the nurses at their desks. It was normal to see many IV poles parked together as me and my friends would sit on the couch next to each other, racing Mario Kart on TV. Due to my in-patient treatment, we literally lived at the hospital. I saw the nurses, doctors, and cleaning crew more than I did my own family … now I consider them “my hospital family.” I missed the 4th of July fireworks that we could always see from our house, but I was able to see them through the window from our hospital floor. I could no longer go to the pumpkin patches to pick out a pumpkin for Halloween or spend Thanksgiving with my whole family- just the four of us had turkey dinner from the hospital cafeteria in my hospital room.